Home EDUCATION Varsity building classrooms to support vulnerable students. Varsity building classrooms to support vulnerable students. 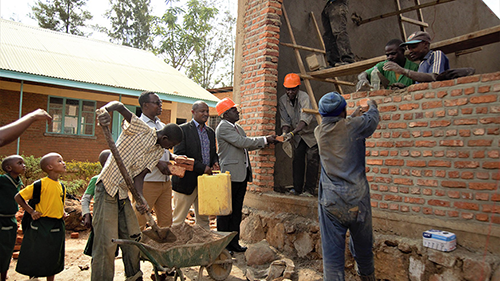 Pupils in Groupe Scolaire de Gahanga in Rwanda are going to have another classroom block with the capacity to seat 46 pupils, fully furnished with desks and chairs and with a water collection tank added to their school by the opening of the second term. The new smart classroom is a donation from Mount Kenya University and was triggered off when the varsity’s Chairman and founder, Prof. Simon Gicharu met with the Mayor of Kicukiro and discussed issues regarding education in the district. “Am really happy and I thank MKU for the support they are doing in the education sector. When we meet with the founder of MKU, he asked me where we needed support and I suggested the education sector. We do have congestion in classrooms at Gahanga and he decided to build a smart class for the school” said the mayor. The construction of the classrooms which is in its final stages started in February this year and is likely to be complete by the end of May. While supervising the progress of the construction , the Vice Chancellor of MKU Prof. Edwin Odhuno praised the speed at which work was being done and promised future cooperation between the school and the university. The head master of G.S Gahanga Felix Niyitegeka thanked the management of MKU for thinking about the school and building a classroom that was really needed. 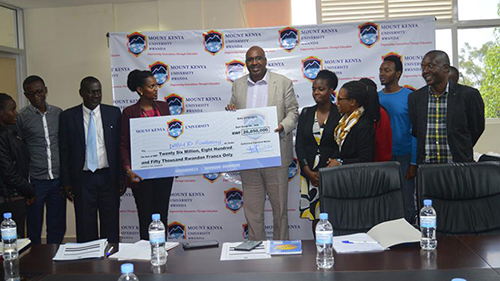 In line with the support in education sector, over 100 students from Imbuto Foundation are benefiting from Mount Kenya University’s Cooperate Social Responsibility program.